Current land and water management issues in the North East region include catchment management, catchment planning (including Declared Water Supply Catchment management), river health and management issues, water quality, floodplain management, salinity management, catchment condition monitoring, and land degradation. The Regional Catchment Strategy (RCS) is the primary integrated planning framework for land, water and biodiversity management in the North East Region. It is also the overarching strategic document, under which are found the various action plans for water quality, river health, salinity, invasive plants and pest animals, floodplain management and biodiversity. Information on Floodplain Management on the DEPI website. DSE's Catchment Information mapper website (external link) provides interactive access to data and information on vegetation, salinity, floodways, 1 in 100 year floods, groundwater bores and salinity observation bores. A full text downloadable version of the former Land Conservation Council's Final Recommendations for the North-Eastern Area (Benalla - Upper Murray) Review (January 1986) is available on the Victorian Environmental Assessment Council website. These provide an ongoing framework for public use of land in the area. Recommendations in the text incorporate those of the LCC's original North-eastern Area Districts 1, 2 and 4 investigations, and have been edited to reflect government variations and amendments at the time of approval, and subsequent changes. The recommendations are grouped under major headings, such as Parks, Flora and Fauna Reserves, Agriculture, State forest and so on. Key recommendations are for Mount Lawson State Park, Wodonga and Mount Mitta Mitta Regional Parks. A full text downloadable version of the former Land Conservation Council's Final Recommendations for the North-Eastern Area (Districts 3, 4, 5) (April 1977) (external link) is available on the Victorian Environmental Assessment Council website. These provide an ongoing framework for public use of land in the area. The recommendations in the text have been edited to reflect government variations and amendments at the time of approval, and subsequent changes. The recommendations are grouped under major headings, such as Parks, Reference Areas, Wildlife, Hardwood Production, Bushland Reserves and so on. Key recommendations are for Mount Buffalo National Park, Wabonga Plateau State Park, Mount Pilot Multi-purpose Park and Chiltern Regional Park. A full text downloadable version of the former Land Conservation Council's Final Recommendations for the Alpine Area Special Investigation (November 1983) is available on the Victorian Environmental Assessment Council website. These provide an ongoing framework for public use of land in the area. The recommendations in the text incorporate those of the LCC's original Alpine investigation, and have been edited to reflect government variations and amendments at the time of approval, and subsequent changes. The recommendations are grouped under major headings, such as The Alpine Park System, Wilderness, Reference Areas, Flora and Fauna Reserves, Agriculture, State forest and so on. Key recommendations are for substantial additions to the Alpine Park system. 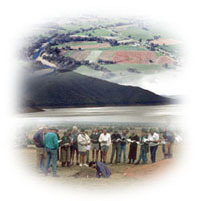 The Victorian Landcare and Catchment Management Magazine online site (external link) of DSE provides copies of all these magazines dating back to 1996. North East Catchment and Land Protection Board (NECALPB) (1997). Regional Catchment Strategy. Victoria.